Availability: Second hand only. I guess the license expired. It really didn’t take long for traditional dice-based role playing games and video games to form a symbiotic relationship. It makes sense too – the developing video game industry gets access to rich, established worlds they can create stories around, and the RPG systems get to expand their audience through automating much of the mundane work of a pen-and-paper game. 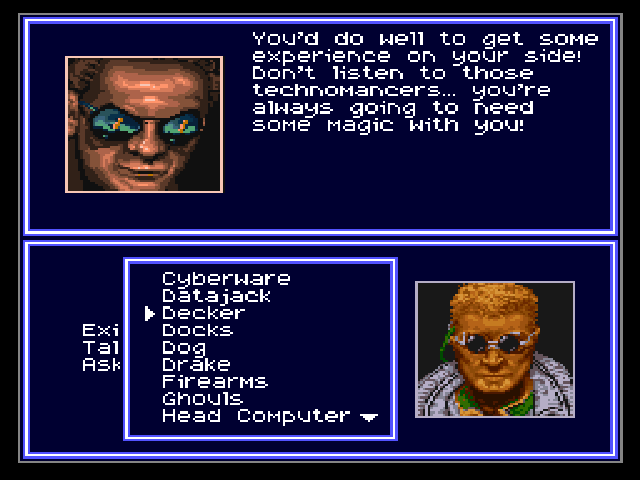 Shadowrun is one such universe that offered two distinct video games in the early 90s. The Genesis and SNES versions are completely different (as is the 2007 PC arena shooter), and in no particular order, we’ll take a look at the SNES game first. Shadowrun takes place in the year 2050, in a world that is the very definition of cyberpunk. Megacorporations rule megacities with complete control and oversight, so it’s up to mercs called “shadowrunners” to slip through the cracks and deal in the valuable theft and trade of information. 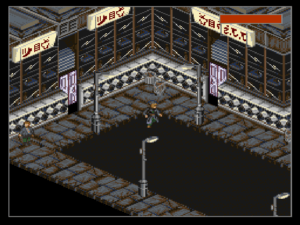 The universe also mixes some traditional fantasy elements, so spell-casting mages share the screen with cybernetically-enhanced samurai, while orcs, trolls, shapeshifters, vampires, and elves have all carved their own places in the dingy neon streets. You play as Jake Armitage, a particular kind of Shadowrunner known as a “decker.” These guys have a head full of implants that allow them to link into cyberspace (known here as The Matrix), battle computer countermeasures through a digital persona, and use their own brains as a portable storage device (think Johnny Mnemonic). Jake’s last deal has clearly gone wrong, as you awaken on a morgue slab with total amnesia. After giving the docs a good scare, you’re on your way to piecing together who you are, what you were up to, and why a whole cadre of hitmen want you dead. The basic plot probably wasn’t as cliche in 1993 as it is today, but luckily, this only part of the total situation. The details of your investigation give you ample opportunity to explore the world of Shadowrun, and (at least to someone totally unfamiliar with the pen-and-paper RPG) seems to offer a solid introduction to the series. You’ll meet the other races, get the opportunity to hire other runners for jobs, get a taste of the corporate machinations within future Seattle, and explore cryptic messages from a “spirit guide” which suggest you might be destined for something greater than a simple bum trading information scraps. Damage numbers fly during combat. Functionally, the game is a point-and-click adventure. This is absolutely a problem on a console, and you are indeed expected to steer a hand icon around with the D-pad and pixel-hunt for small objects. Movement is handled normally, and you control your character directly instead of pointing at where he’s supposed to go. 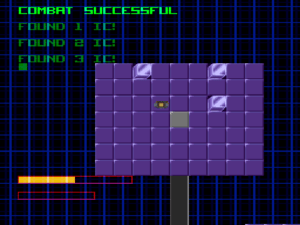 However, when you hit the button to interact or enter combat, the hand icon or gun crosshair will appear, respectively. You cannot use the SNES mouse for these modes, and there are no keys to snap the icons to something you can use. Instead, you’ll have to awkwardly float the cursor around to see if an interaction label pops up. The only break you’re cut is that the gunsight cursor will stay on whatever enemy you place it over, at least removing the need for careful aiming (after the initial target selection, of course). You progress through various districts of Seattle in an isometric view, looking for buildings and rooms to enter and search. While NPCs will sometimes provide you direction to specific spots, most areas are not identified up-front; you won’t know an office has a doctor within until you step inside. As a result, you’ll be popping into every door you can open, and taking every loose item you can spot. Meanwhile, hitmen randomly appear from the grass or snipe from windows, essentially acting as the game’s random encounters. You can either run to the next screen to lose them, or stop to kill them for XP. It’s an RPG through and through. The other part of the investigation comes from the conversation system. Interacting with a valid NPC sends you to a dialogue screen. You can either use “Talk” for a single, character-specific line of dialogue, or “Ask” about specific topics you have collected. As you chat up the locals, certain words will appear in bold. These words are then added to a permanent list of items you can ask about. That list grows quite long toward the game’s end, and who holds the proper information isn’t always clear. Be prepared to spend some time asking every new NPC about every topic you’ve got. The final piece takes place within the world of cyberspace. Once you locate a cyberdeck, you can use it on certain computers to enter The Matrix. Your goal here is to grab data or unlock “real-world” doors by playing a minigame similar to Minesweeper. The computer world is seen from an overhead view made up of tile grids. Tiles will randomly have countermeasure programs on them. These programs are invisible, and like Minesweeper, you’re given notice of how many surrounding tiles have enemy traps. If you think the tile you’re facing has a trap, you can press B to attack it. If you’re successful, the trap is disarmed. If there’s nothing there, you lose a small amount of energy. Overall, this minigame isn’t terribly difficult – nor does it seem meant to be. The information you can pull is also limited, and usually just deposits money in your account. Still, it’s a nice diversion. There are no delineated quests, so much of your XP comes from killing the randomized hitmen. Again, this XP isn’t displayed to you, so after a handful of kills you’ll be notified you’ve earned some karma points. Karma points can be spent at any bed you can sleep in (which also refills your health and allows you to save your game), and will boost simple attributes and skills. There are just three attributes and around five skills, so this is certainly neither deep nor complex. Progress is greatly accelerated too, and dropping no more than five enemies should net you at least one karma point. With so few things to spend points on, you can get a strong character pretty quickly. Further, there are a few rooms or areas that are pretty much designated grinding spots. Enemies will reappear endlessly, letting you cut them down and head back to a nearby bed to recharge. The downside is that the game seems to expect you to do this – I despise RPGs that force you to grind – but these factors make it take hardly any time at all. I spent a little less than an hour in one such spot early on, and came out with a character strong enough to take through the rest of the game. Hit the pubs to hire other runners or ask around for information. Graphics aren’t bad, though the console’s abilities and game’s perspective both make things a bit smallish. Due to the helpful object labels, I never had an issue with knowing when I was pointing at something that can be used. There is a lot of re-used art, so all Orcs look the same, there’s only one or two businessmen, etc. 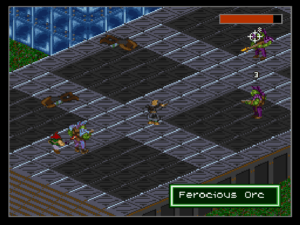 The engine also creaks along when multiple enemies are on the same screen (such as your party of 3 versus 4 or 5 enemies). This clears up as soon as enough foes are slain. Music works and fits the style, though there are only a handful of loops used across the entire game. My biggest complaint is that the story focuses entirely on Jake. You can hire other mercs, but you can’t raise their skills and they don’t stick around (when they’re gone, you can find them at the same spot and just rehire them). This means you never get a real RPG “party” going, and so you have no chance for interaction between characters or side stories to investigate. Jake’s tale is interesting enough, but hardly “epic.” In fact, the limited focus and simplified skills almost makes this come off like “My First Little RPG” – whether this is intentional for a console audience, I can’t say. None of it’s bad, all of it’s worth playing, but there are certainly greater games in the genre. 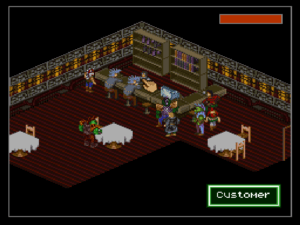 Overall, Shadowrun was a fun experience and a quick RPG. The controls were always a problem, and I never stopped wishing the game was also available on PC instead. But, consoles got so few of these experiences that I applaud them for bringing a solid one to the SNES. Great use of the Shadowrun world. Engaging story. There’s something to be said for a quick RPG that won’t take 100 hours. Fussy interaction controls. Some reused and low-detail art. Shorter and more limited RPG than its PC bretheren. The J Man loves him some video games, of all eras and types. Finds them, plays them, then writes about them here for curious future generations. Follow him on Twitter at @BurningStickMan for even more musings and questionable life decisions. Hoi, chummer. This is one of my all-time nostalgic favorites, even if the controls and interface are a bit klutzy. I got into pen and paper RPG’s quite early on (age 11 or so), which was in hindsight too early to be into them, because all of my contemporaries were still more interested in playing with Nerf footballs and Ninja Turtles action figures. This meant I had a fairly decent sized collection of RPG books (and shedloads of dice) but usually no one to play them with until many years later. One such book in my collection was the 2nd edition of Shadowrun. The cyberpunk meets high fantasy world had me hooked from the front cover alone. I pined for my friends to hurry up and hit puberty so we could play it. This game tided me over until that time came (and when it did, I discovered that the clunky combat in this game is nothing compared to the Byzantine means of resolving combat situations in the tabletop version). It all seemed very cool and edgy to the 11 year old me, and I have fond memories of spending one of those ‘endless’ summer vacations from school staying up late into the night playing this one on the dinky little 15′ inch television in my bedroom. Ahh. Good times. Um… yeah. Apologies for waffling on like that. No apologies necessary for an interesting story! It’s a new perspective for me because I really fell into the Turtles and Nerf camp myself at that age, and have never played a tabletop RPG. I *did* spend a few years involved in a light virtual version of the concept (a weekly “sim” based off the X-Files in an AOL chat room), so I at least have some experience with an RPG run by a living, thinking DM, and certainly appreciate how video games have never come close to replicating that fluidity and variety. I also remember the one rulebook I’ve ever looked at was for an RPG based off of Aliens. I was just thumbing through it, but could quickly appreciate the depth they got into things. There was a diagram of an APC pointing out some part, and I was delighted at first – thinking “Oh, that’s what that does!” – followed by remembering that I hadn’t actually learned how anything “works” because none of it was real. But, oh, I can easily see how people can lose themselves in such rich worlds. Thanks for taking the time to read and comment! 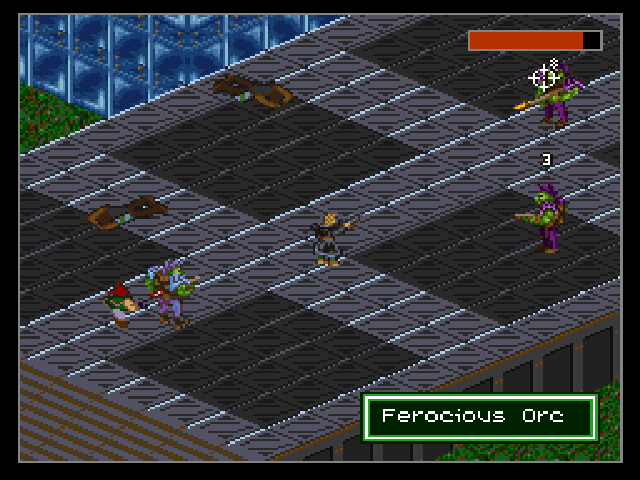 I recently bought Shadowrun Returns for PC on GOG.com. Thought you might be interested, because this new version in very good. Also, I miss your reviews. Will you turn back to write any time soon? Oleg! Good to see you around! You made a good buy with Shadowrun Returns, I did a writeup of it for another site, I enjoyed it quite a bit. As for content here, well, you may want to stick around in the next few days, we might just have something for you. © 2019 Just Games Retro. Some Rights Reserved.